So you’re thinking of walking or hiking in Crete? Excellent choice! The southernmost and largest of the Greek Islands offers beaches, sea, sun, and ruins of ancient civilizations. But it’s also a true walkers’ paradise. April and May are the best months to go exploring the green and rugged interior. The meadows are blanketed in wild flowers and the air is still fresh. Early fall is good too. Hiking in Crete can be an easy half-day affair through villages on mostly flat terrain, or a longer and more challenging tramp through gorges, or up and down hills. If you do not have your own transportation, or if you are travelling on your own, you might want to join a guided hike. 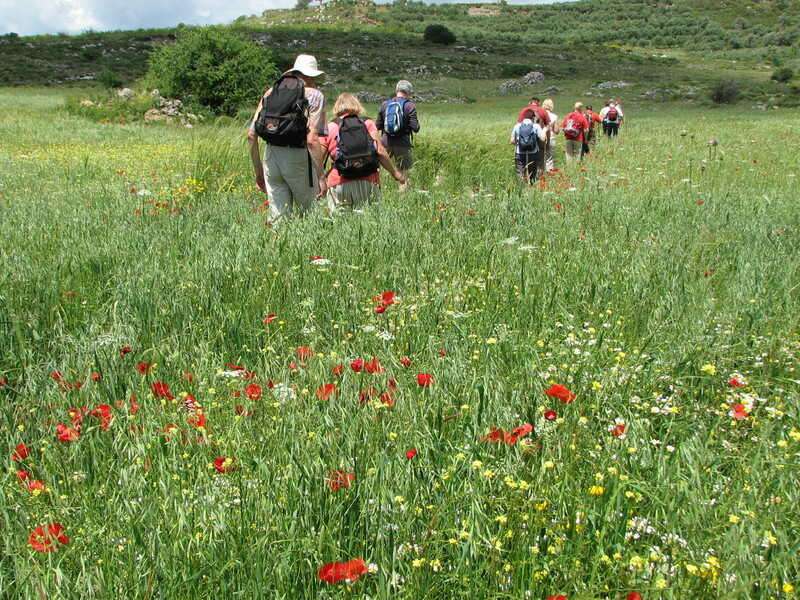 The Happy Walker, a local company, organizes daily guided walks in the area around Rethymno. When showing up at their office, they first sit you down and offer you a shot of raki, the ubiquitous Cretan spirit. Business here is not rushed, and the friendly Dutch owners, Anthony Pruissen and friend Ineke Banninga, have time to chat. “We started our company around 1990”, says Pruissen. “The idea came up during my guiding in the Samaria gorge. There are so many other beautiful areas for walking in Crete”, he continues. “At that time there existed no other company which specialized in walking, so The Happy Walker came into being”. Their web site details seven walks, each offered on a different day of the week and costing 32 Euros. On a bright Sunday morning in May, private cars and taxis whisk our group of 17 to the starting point of the walk in the village of Kare, near Rethymno. Most participants are in their forties and fifties. The walks last around 4 to 5 hours and can be accomplished by anyone who is reasonably fit. Our guide is an athletic Dutch woman named Pia. She addresses the group in both English and German and finds out where we’re all coming from. 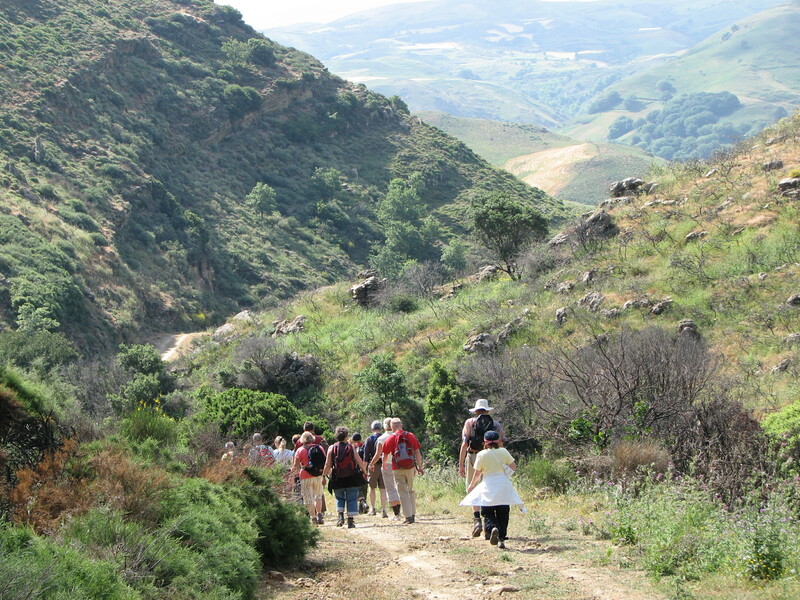 The hike starts through gently undulating fields covered in olive groves and vines. A couple of farmers riding donkeys greet us with a friendly “kalimera” (good morning). Bushes of yellow flowers grow close to the path, and the view suddenly opens up to reveal a perfect pastoral landscape of fields and farms, with hills layered in the background. Falling behind the group on purpose, all I can hear is the wind and the tinkling bells from a herd of grazing sheep. Occasionally the path goes through a village, its houses bedecked with potted flowers, and donkeys tied to blue fences. As we walk, I ask Pia why she moved to Crete. “I fell in love with it”, she says simply. The largest island in the Greek archipelago, Crete’s interior is lush, green, and very mountainous. It is 250 kilometres long and about 60 kilometres at its widest point, and offers a surprising variety of landscapes, from coastal paths, to mountains, gorges and caves. Of its estimated 2000 species of plants, 160 are found only here. It has one of the richest varieties of indigenous herbs in the world, used in both cooking and medicinal preparations. It also produces olive oil, one of the mainstays of the Cretan diet. Pia points down to an area where fossils of large shells lay partly exposed, testifying to the fact that Crete once rested at the bottom of the sea. A bit further down, a young man in a leather jacket makes great showmanship of his sheep herding skills. “Ptchhhhew” he utters, waving his arms at the confused animals. 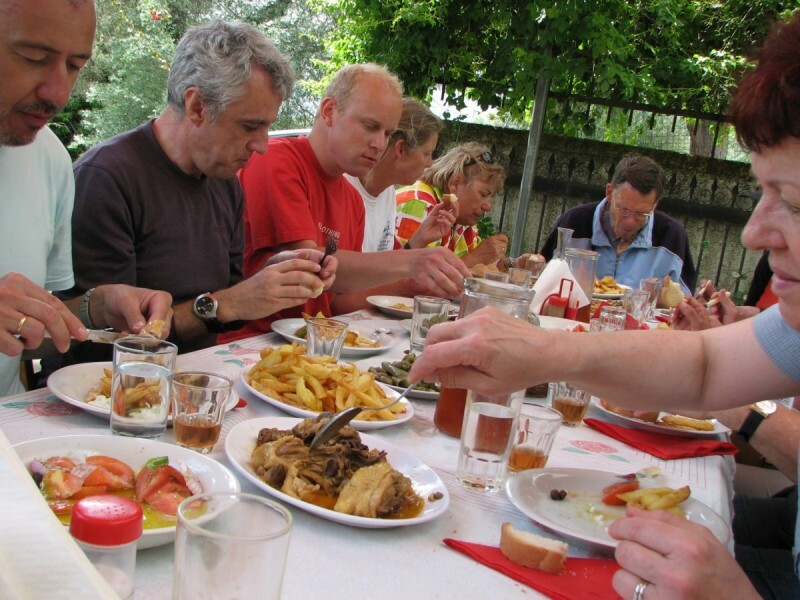 After two hours, a stop at a farmhouse provides some well needed refreshment: coffee (hot or iced) and of course raki. The pause lasts a leisurely 45 minutes and the group has time to chat. The second part of the hike starts with a short but steep climb. The top of the hill provides a 270-degree view of the surrounding countryside. Leaving the wide dirt path, the group crosses a field awash in wild flowers. Poppies, daisies, and many other buds paint a pointillist canvas of red, white and yellow on the grass. And right there, in the middle of it all, lay the remains of a Byzantine basilica, with a chunk of perfectly preserved mosaic floor. A steep descent on a narrow trail leads back to the starting point, completing the 4-hour, 12-kilometre hike. 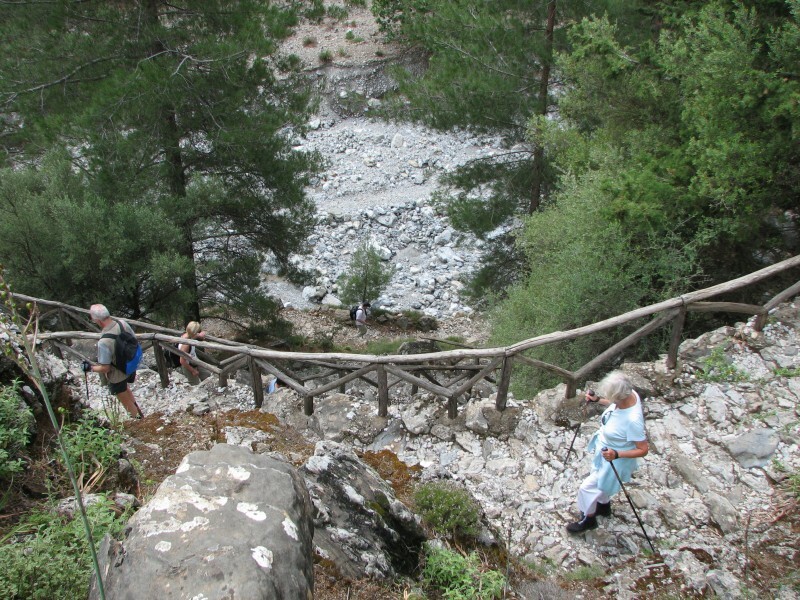 If your idea of walking in Crete involves a more challenging hike, the popular Samaria Gorge may fit the bill. At 16 kilometres from end to end, it is one of the longest canyons in Europe. This hike can be done independently using public transportation. It entails taking an early morning bus from Chania to Xyloskalo, the entrance to the gorge, where you must buy a 5-Euro ticket to access the National Park. The hike starts with a 1000-metre descent down a steep zigzagging path with wooden handrails. Although the bottom is mostly flat, the stony ground is very uneven and you will need rugged footwear with thick soles and some ankle support. You will walk between sheer rock walls (500 metres at their highest point), crossing and re-crossing the stream over wooden planks or carefully placed stepping stones. At the narrowest point of the gorge (the Iron Gates, only 3 metres wide) you might have to walk through water in the spring time. The bushes with pink flowers that grow everywhere in the gorge are oleander: very pretty, but extremely poisonous if ingested. The walk takes from 4 to 6 hours, but several rest stops are equipped with picnic tables and toilets. You can refill your water bottle at many springs along the way, but you can’t buy food in the park. Several other gorges cut through the western part of the island, such as Imbros, which is only 8 kilometres long. If you can’t bear to leave the sight of the sea behind, coastal paths on the southern coast let you hike between towns such as Hora Sfakion to Loutro (5.5 kilometres), or Paleohora to Sougia (14.5 kilometres) passing inviting beaches and coves. As if this wasn’t enough, Crete is also the ending point of the E4 route, a cross-European hiking trail for experienced trekkers that begins in Spain and meanders through the island over a distance of 320 kilometres. The Happy Walker: 56 Tobazi Street, Rethymno. Tel: 28310 52920. They also offer 8 or 10 days hiking holidays. 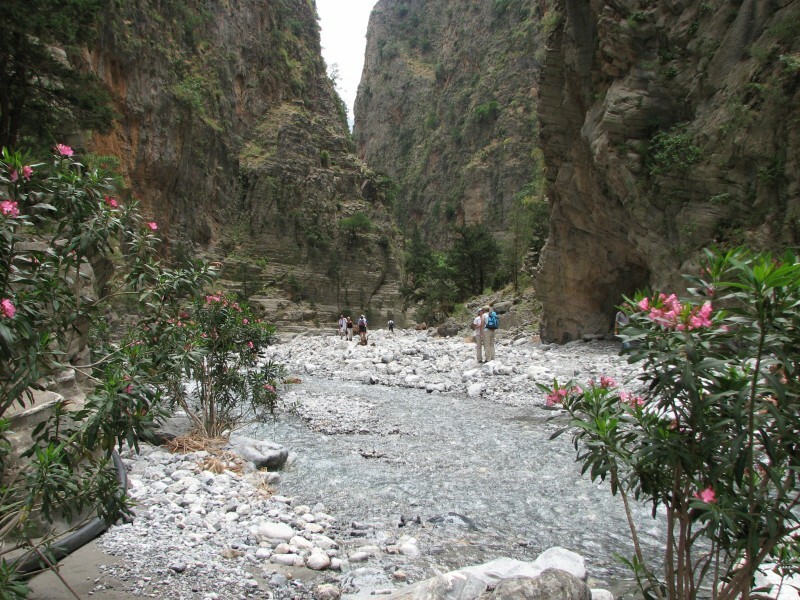 Samaria Gorge: Open May 1st to October 31 (may close earlier), 6:00 am to 3:00 pm. Get all information at the Chania Tourist Information Office. Where to stay in Crete: The Happy Walker can help organize affordable accommodation near Rethymno. Right in town, try: Olga’s Pension (small/double room: 35€ / 45€ – including breakfast) or 3-star Hotel Brascos. For more hotels all over Crete and even private apartments, check out Booking.com. 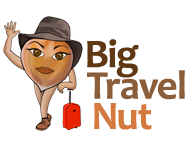 How to travel around in Crete: renting a car allows you complete freedom to explore, but there is also a fairly extensive network of buses covering the west, centre, and east of the island. Ca me donne le goût d’aller marcher en Crête! Bonjour Marie, je ne sais pas s’il existe une compagnie qui organise des randonnées personnalisées près de Rethymno. Peut-être que vous pouvez vous informer auprès de Happy Walker à voir s’ils pourraient le faire, ou connaissent quelqu’un…?